The Transverse Ranges are an east-west trending series of steep mountain ranges and valleys. 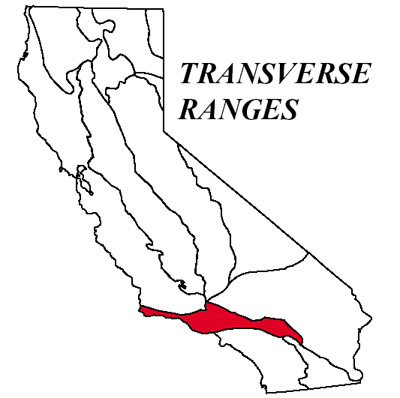 The east-west structure of the Transverse Ranges is oblique to the normal northwest trend of coastal California, hence the name "Transverse." The province extends offshore to include San Miguel, Santa Rosa, and Santa Cruz islands. Its eastern extension, the San Bernardino Mountains, has been displaced to the south along the San Andreas Fault. Intense north-south compression is squeezing the Transverse Ranges. As a result, this is one of the most rapidly rising regions on earth. Great thicknesses of Cenozoic petroleum-rich sedimentary rocks have been folded and faulted, making this one of the important oilproducing areas in the United States.